XTREMEV™ for Sale in Salem, MA | BRAKE & CLUTCH INC. 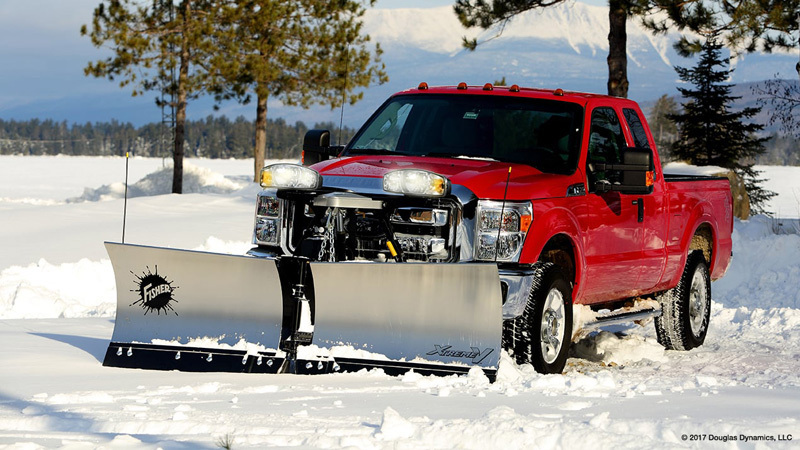 The FISHER® XtremeV™ v-plow is rugged and reliable in the toughest of winter storms in Salem. Use the plow in V, angle or straight position to bust through hardpack, clean up corners and narrow driveways or drive thrus or navigate crowded parking lots. This commercial grade, trip edge v-plow is available in stainless or mild steel and fits most ¾ ton and 1 ton pickup trucks up to 5500 class. Available in stainless steel or powder coated steel, the XtremeV™ snow plow blade is available in 7' 6", 8' 6" and 9' 6" widths*. The blade comes standard with a high-carbon steel cutting edge, increasing wear resistance, and features a 70-degree attack angle for enhanced scraping and back dragging. *The 7' 6" model is available in stainless steel only. The XtremeV™ v-plow features our rugged x-bracing design which is constructed from four vertical ribs and eight x-bracing ribs. The ribs reinforce the blade for structural integrity and exceptional torsional strength, even under the punishing stress of commercial plowing. Each v-plow blade features independent trip-edge protection to get over bumps and hidden obstacles, whether in V, scoop, or straight-blade configuration, helping to protect the plow, the truck and the operator. Since only the bottom edge trips, snow stays in front of the blade, so you can keep on going without dumping the entire load of snow. The FISHER® trip edge uses compression-type springs that never require adjustment and will not wear out like extension springs. InstaLock double-acting cylinders allow the operator to lock the wings together to use the v-plow in straight blade mode with single button control. Double-acting cylinders also hold the wings firmly in place for clean, efficient back dragging. For exceptional snow containment in all positions, the XtremeV™ v-plow has a center deflector designed to prevent snow from going over the top of the blade and the formed cutting edges reduce trailing snow. The FISHER® chain lift design offers a wide range of performance and reliability advantages over a direct lift system. Clean Scraping The chain lift design allows the blade to continuously float while plowing, enabling it to freely follow the contours of the plowing surface for a cleaner scrape. Higher Stacking With a chain lift you can stack snow higher because the plow's movement is not restricted by the length of the ram stroke like on cylinder lift systems. Reliability With the simple mechanical chain lift design, there are fewer hydraulic and electrical components to worry about, so you can count on long life dependability. Easy Recovery In the rare event of a hydraulic failure, you can push the snow plow up into a snowbank and short chain it to the specially designed bracket for safe transport back to the shop. Blade Width 7' 6" 8' 6" 8' 6" 9' 6" 9' 6"
Lift Cylinder 1½" x 10" 1½" x 10" 1½" x 10" 1½" x 10" 1½" x 10"
Angling Rams 1¾" x 11" 1¾" x 11" 1¾" x 11" 1¾" x 11" 1¾" x 11"
Cutting Edge 3/8" x 6"1/2" x 6" (Optional) 3/8" x 6"1/2" x 6" (Optional) 3/8" x 6"1/2" x 6" (Optional) 1/2" x 6" 1/2" x 6"